Spray Nozzle Engineering supplies innovative spraying solutions to the New Zealand and Australia markets. The company offers solutions to several industries such as: dairy, food and beverage, mining, fire protection, pharmaceutical, paper, steel, automotive and more. Any application involving the use of liquid and air in the application of cleaning, coating and spraying is covered by their extensive range of products and engineered solutions. As a leading spraying specialist, the company has engineered systems for coating, spraying, cooling, coating, blow-drying, clean in place (CIP), washdown, tank cleaning, sanitising, and much more. Compressed air knives, specially designed for bottling and packaging lines. Food Plant hygiene is a major focus for Spray Nozzle Engineering. Cleaning chemical and sanitising application equipment, safety steam and water mixers, stainless steel reel and hose stations; mean that they can supply a total cleaning solution to every part of the process. Spray Nozzle Engineering can supply a spray cleaning or compressed air blowing solution for every type of processing system, wet, dry, liquid fill, packaging and more. With offices throughout New Zealand and Australia, they can assist with service and advice. To seek out and or develop those products that will provide the focal point to our teams marketing efforts, surpass our customers needs and expectations and in this way, add value to our company through our peoples best marketing efforts of these products. See our product’s range here. 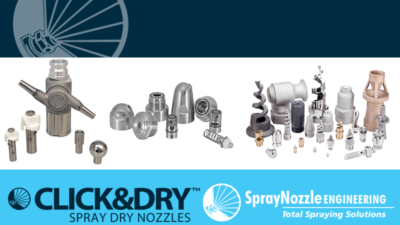 Spray Nozzle Engineering maintains a large stock offering with well over 20,000 different spray nozzles and associated products for quick product turn around.